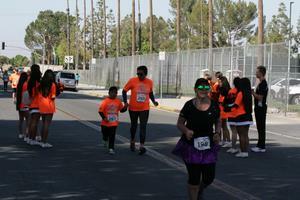 Last year's race was a huge success! With over 400 participants and hundreds of race supporters, we exceeded all expectations and we expect to do the same in 2019! All proceeds from the race will go to the San Jacinto Education Foundation as well as a portion will be given to the Estudillo Mansion Barn Restoration, a City of San Jacinto project. The San Jacinto Education Foundation is a non-profit organization dedicated to providing resources, opportunities, grants, scholarships and recognition to the students and staff of the San Jacinto Unified School District. Each school is given funds to help support our students in their goal of becoming college and career ready. Sponsors of this event benefit the community and their business. Business contributions provide many great opportunities to be promoted in the San Jacinto Valley. Please visit the race website www.sjfunrun.com for information about race details and registration (for adults). 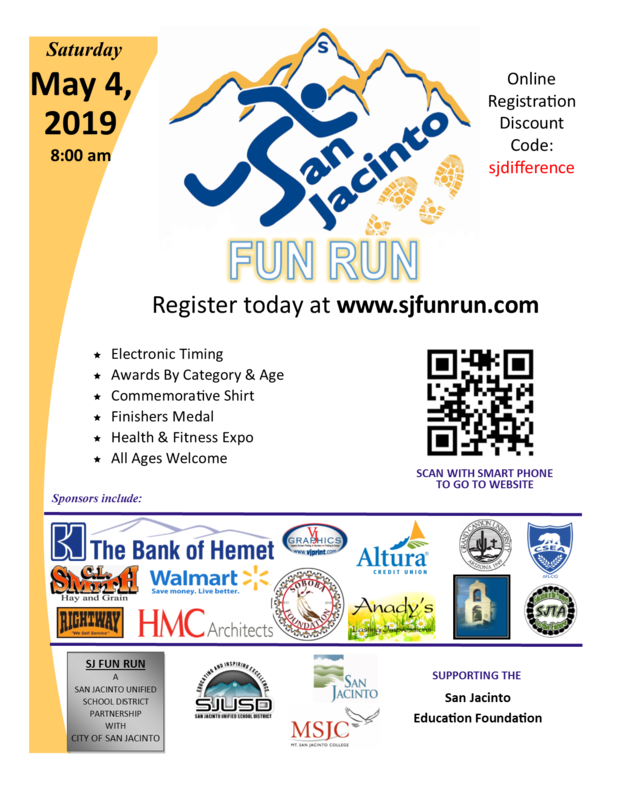 The 5K (3.1 mile) race starts/ends at San Jacinto High School, begins promptly at 8:00 a.m., and involves finisher medals and winner medals for 1st, 2nd, and 3rd in various age/gender categories. A modified course is available for those with physical limitations. Students can register for a discounted rate of $15 by use of the form below (Student Waiver), rather than the online registration. The student rate includes a race-bib, t-shirt and registration gift bag. One of the most popular donations collected for the annual race is for the "Run in Your Shoes" program, where a $45 donation is used to register a student and provide them with a new pair of running shoes (see form below). Vendor applications are found below for businesses, charities, and other service providers -- no cost to set up a booth!